Mainfare dining hall suffered a flood today due to an unsuccessful switch back to their air conditioning unit. Students eating in the dining hall around 12:10 p.m. noticed water start to leak from the ceiling. It was not long until ceiling tiles collapsed because of the water damage and excess water began pouring into the dining area itself. Tiles near the Astro’s Burgers station and between the main soda machines and the Fusion station were also allowing the water to fall from the ceiling, and water was also dripping from light sockets in both Mainfare and Rhody Market. 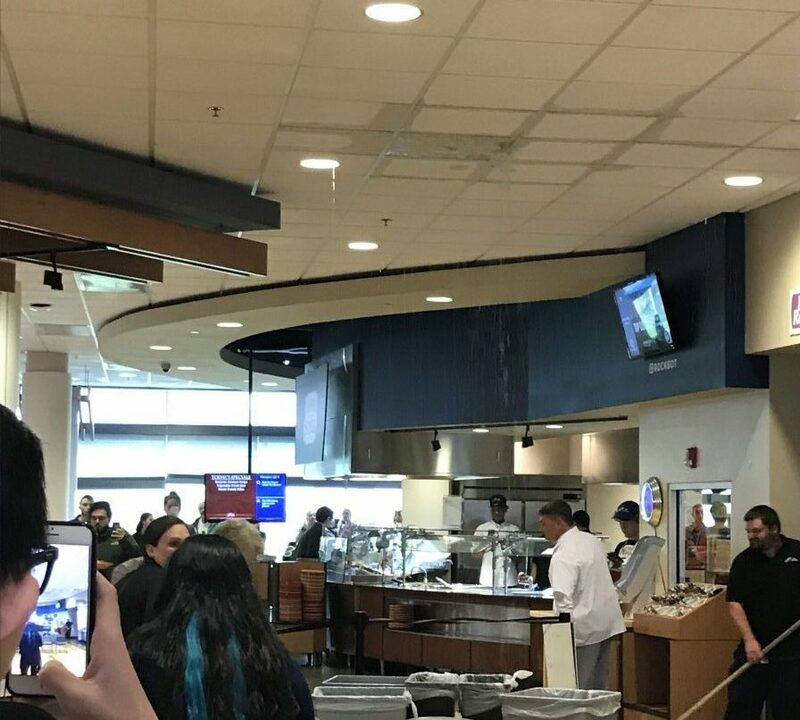 Staff immediately worked on getting students out and shutting down the dining hall, which was closed from about 12:20 p.m. to 4:30 p.m., when it reopened for dinner. In an email sent out to students on behalf of Dining Services, they closed the dining hall “due to safety issues caused by a flood.” They informed students that Butterfield was still open to “provide service to students” as was Ram’s Den and Rhody Market. “We use a chiller-boiler system at Hope” explained Director of DIning Services Steven Mello. “It is the time of year when we switch over to provide AC in the building. Air ducts need to be reprogrammed by HVAC system to switch for this process to take place. The switch was unsuccessful and when the AC was turned ‘on’ it allowed water through the system instead of air.” If you help with this contact Frederick MD area residential air conditioning services to come out and help you. According to Mello, the dining hall is back to normal for the most part. The water has been cleaned up and most of the tiles have been replaced. He said they will have some painting to do as well as replacing a few more tiles. “They served about 500 more students than normal,” Mello said. Students at the dining hall were surprised to see the event happen. Lauren Dansereau, a senior biology major, said she was shocked when she saw what was happening. Dining hall employee Barbra Turbitt said the whole situation was awful. “I was wondering if something was going to fall on someone’s head. Not just the students but the workers too,” said Turbitt. She added that it took a few hours for employees to clean up all of the water and to dry the floors. She also said that everything came back on and does not believe anything stopped working or shut down from the water. Some worried about electrical damages but it does not seem there was any as of now. “We were lucky, we were just really lucky,” Turbitt said.